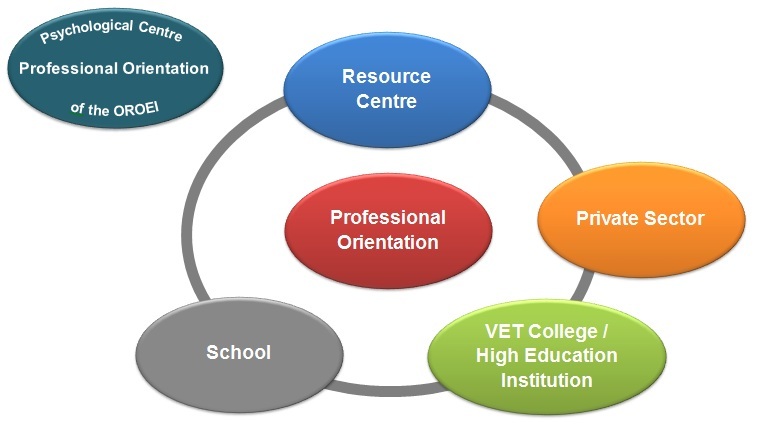 Professional Orientation is a set of services and activities, which allow individuals to make decisions on their education, training and occupations, and manage their own careers. During this process individuals are provided with information on the labor market, and various educational and employment opportunities. It also helps individuals to understand own aspirations, interests, competences, personal characteristics, qualifications and skills, and linking them to desirable work opportunities. Assist interested individuals with preparation of resumes, motivation letters and interviews. Ministry of Education and Science of Georgia, after consulting with various international and local experts and sharing international experience, believes it is important to involve the following stakeholders into the Professional Orientation system: psychological center of the resource officers in schools, resource centers, private sector, providers of vocational and highest education programs, and general education institutions. It is from the school age where children have to lean about different occupations and their characteristics, have understanding of the labor market and its development perspectives, get to know people with significant achievements in various fields, understand own interests and possibilities through developing adequate self-awareness and creation of specific career plan. Professional Orientation service is managed by the head of Psychological Center of LEPL Office of Resource Officers of Educational Institutions, managing 5 coordinators. At the moment, Resource Centers of Georgia have 103 professional orientation officers, responsible for successful implementation of projects in 20-22 schools. At this stage, professional orientation classes are held for 9-11th graders. Besides, vocational education institutions also have professional orientation managers, who help applicants, students and graduates with correct guidance and employment support.